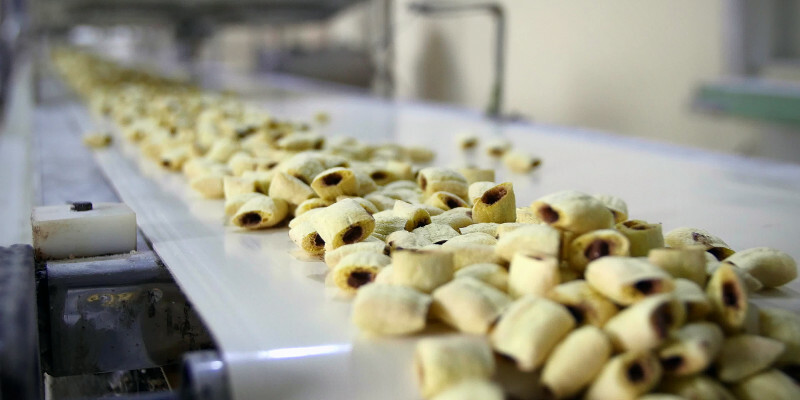 Bakeries and pastry manufacturing plants employ a wide variety of conveyance systems to move ingredients, dough, formed products, finished baked goods and snacks, through the processing line and even through the packaging stage. Belt conveyors are the most common choice in today’s automated bakeries, and many different belts are available. Fabric, rubber, plastic, steel and wire mesh belts are all fairly common. In order to better understand the differences and the types of applications these belts are best suited for, European Baker and Biscuit asked specialists from Intralox and Rexnord to share some of their expertise in this field. “For extreme temperature, high and low, we have developed various materials. Except for the oven we can manage every application in a typical Bakery and Snack plant. Whether we need to convey pans at the oven outfeed or convey pizza on a spiral freezer running far below zero, we have developed the right materials to deal with these various operating conditions. Intralox has processes in place to ensure we make the right recommendation for the application. It is critical to exchange information with the customer, understand the operating conditions etc.in order to make the right recommendation for not just the belts but also the sprockets, rod material, wear strips etc.”, says Rudy de Mul, global team leader bakery and snack, Intralox. The biggest challenge is not only choosing a belt conveyor for what you are producing today, but designing it in a way so that it can handle a variety of new products in the future. Rexnord’s product portfolio consists of modular plastic and steel and wire mesh belting. “We have solutions for almost any food application and industry for straight running and side-flexing. We also offer a wide spiral belting portfolio, which is great for proofing, cooling, freezing in bakery applications or other plants. We realize that our customers are looking for a hygienic design in conveying belting, but also need temperature and moisture resistant materials in their conveying. That is why we have a selection of the best plastic materials and high quality steel wire mesh belting to offer depending on requirements for a particular application”, Rexnords’s specialists told us. Rexnord’s experts outlined some of the most common requests they receive from their customers. It’s not unexpected that bakeries are looking for small footprint equipment, with flexible configurations, that are heat or freeze resistant. Moreover, they often look for an economic solution, but also long lasting and high quality. Hygiene, is also high on the list of requirements, as easy cleaning impacts both food safety as well as equipment maintenance and down-times. Conveying foods in general also has an added challenge of requiring hygienic belt design to ensure the health and safety of consumers. Rudy de Mul of Intralox explained that hygienic modular plastic offers maximum sanitation, as well as corrosion and abrasion resistance, positive drives, low friction and high strength, as well as customization opportunities. With it, their customers see improved hygienic performance and dramatic reductions in costs and product loss. As companies grow, manufacturers also should constantly evaluate whether their systems have become overloaded over time. If the conveyor system is at production capacity, it might be causing a bottleneck in the whole production line. Often a change in a bakery’s product portfolio might prompt the need for a change, or technological innovations might provide an opportunity to make an operation run better. Most suppliers to the industry perform regular onsite inspections and troubleshooting during annual health checks, providing replacement of wear parts as needed, with recommendations for system improvements. Rexnord estimates that future belt design will have to reconcile flexible configurations, a small foot-print, freezing application, and high hygiene standards, in order to cater even to the most demanding customers. You can read the full story in the latest issue of European Baker & Biscuit magazine (Nov/Dec 2018)!